Scientists at an annual meeting for North Atlantic right whales estimate the species has a little over two decades left to survive unless changes are made immediately. The North Atlantic Right Whale Consortium's annual meeting was held in Halifax on Sunday, and all of the scientists spoke with a sense of urgency about the fate of these whales. 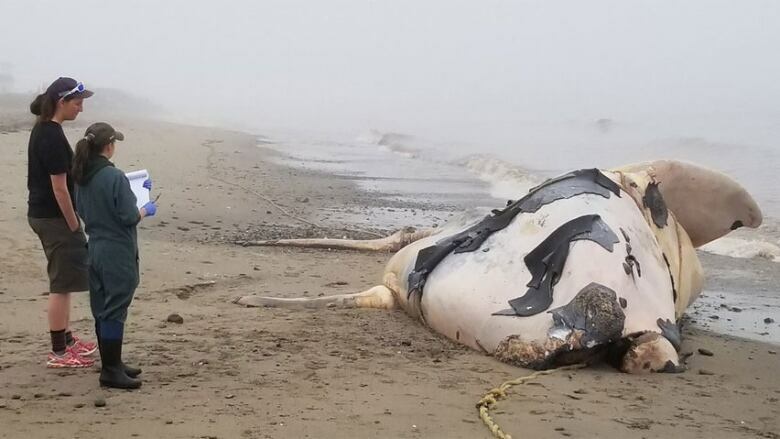 This summer, at least 15 right whales died in Canadian and U.S. waters and scientists at the conference stressed that human activity is the primary cause of death for all right whales. "The sense of urgency for me is finding out that the population that's with us today, a lot of the breeding females may be gone in two decades. And that's a really short period of time for us to do something about this," said marine ecologist Mark Baumgartner from Woods Hole Oceanographic Institution. The most current research suggests there were just 451 right whales left in 2016. In 2015 there were 458 but only 105 of those were breeding females. Between 2011 and 2015, the population lost about 20 individuals per year. If loses continue at this rate, all of the breeding females will be gone in about 21 years. No breeding females means no more baby right whales. "I really do think we only have a few years to make a difference here. The longer we wait, the harder this problem becomes for us to solve," Baumgartner said. The 2017 population estimate, that would include this year's losses, won't be available until sometime next fall. Females are also more negatively impacted by entanglement, according to scientist Amy Knowlton. 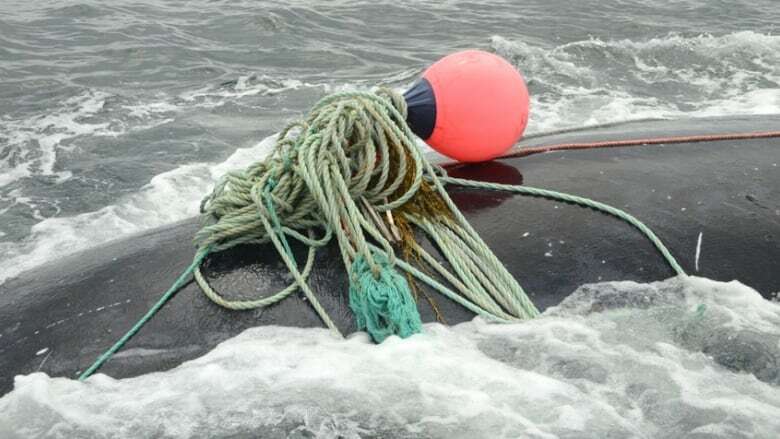 Knowlton, who works at the New England Aquarium in Boston, Mass., said 85 per cent of all right whales have been entangled — and 50 per cent have been entangled more than once. She said scientists have documented 1,390 unique right whale entanglements between 1980 and 2015, but that entanglements have been on the rise in the past decade. "We're very concerned about this new trend and this increasing severity of these cases," Knowlton said. "Rope is really the culprit here. When they get entangled in ropes, and they can't break free quickly, they get all wrapped up resulting in very complex entanglements that can ... cause a health decline." Knowlton said part of the problem is ropes used to catch lobster and crab, as well as for gillnetting, have become stronger and thicker in recent years. 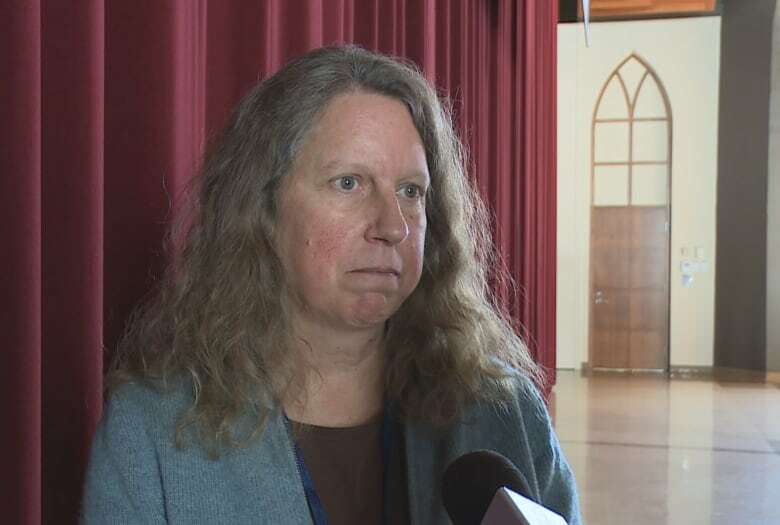 She said one of her biggest concerns is that the young right whales are more vulnerable to getting caught in the stronger rope, and could drown more quickly. "The ropes are too strong for the whales to successfully live among those ropes," she said. "So we're trying to change the rope that's out there or eliminate it altogether." 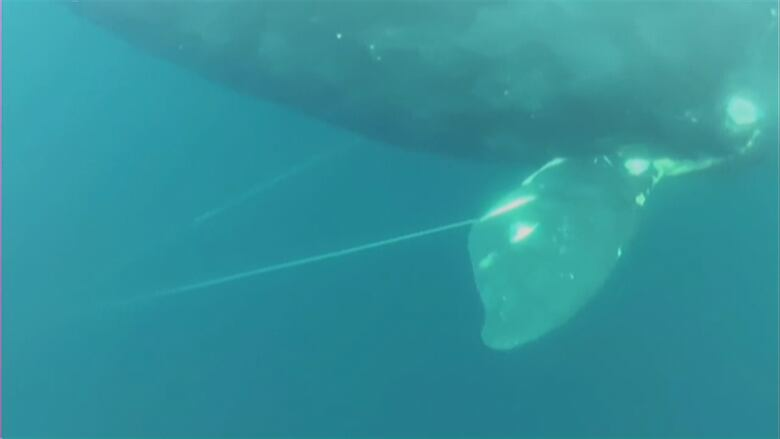 Knowlton said researchers have been working with fishermen to test lighter whale-release rope as well as rope-less fishing that would use other types of technology to retrieve gear off the ocean floor. 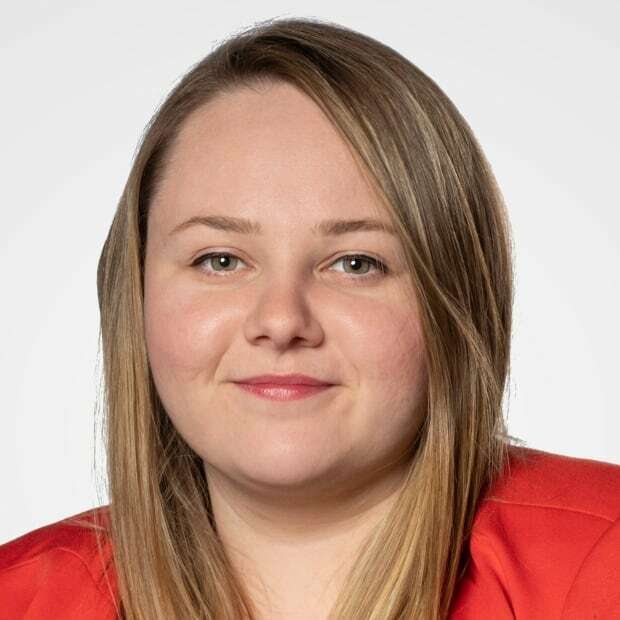 ​"We're trying to get an understanding of what the fishermen need to effectively fish and we now have a better understanding of what the whales need," she said. "I think if nothing changes, and soon, we could see the extinction of this species within several decades. I think we can reverse this trend but it's going to take a lot of collaboration." Along with researchers, Sunday's conference was attended by people from government, the cruise ship industry and fishermen who expressed a willingness to work together. In August, a 10-knot speed limit was put in the Gulf of St. Lawrence to prevent further right whales deaths and several ships have been fined for going over that speed limit. But Julie van der Hoop, who's been studying speed reductions in vessels in relation to the right whale, said most of the ships have been compliant. "People are following the rule, and that's what we want to see," said van der Hoop, who is a post-doctoral researcher at Aarhus University in Denmark. She said one of the most effective strategies going forward is to move vessels around the whales, as speed reductions increase the time it takes for a ship to get through an area. Scientists on Sunday also addressed the challenges researchers faced responding to right whales in the Gulf of St. Lawrence this summer, which included issues with communication and logistics responding to these whales, as well as a lack of funding. Baumgartner said the decline of right whales is happening faster than anyone expected, and perhaps even too fast for scientists to keep up. He and many others stressed that whatever the solution is, it needs to be an international team effort. "I am hopeful that if we take action, we can actually do something to help this species, " he said. "But it has to be soon." After an unprecedented number of deaths this summer, CBC News brings you an in-depth look at the endangered North Atlantic right whale. In a series called Deep Trouble CBC explores the perils facing the right whales.